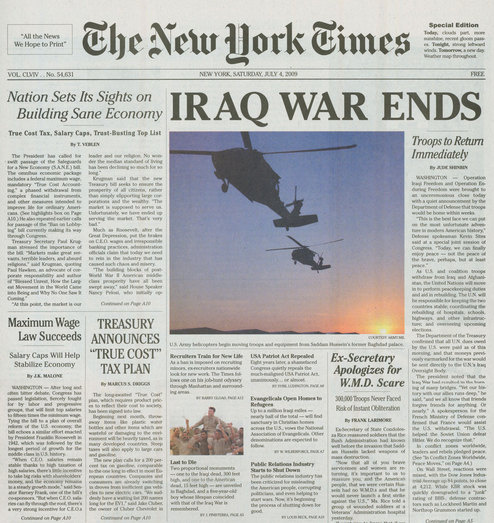 Fake New York Times Distributed With Headline: "Iraq War Ends"
This morning in NYC international pranksters The Yes Men and The Anti-Advertising Agency printed and distributed thousands of copies of a fake version of the New York Times dated July 4, 2009 with the headline “Iraq War Ends”. They recruited volunteers through the website Because We Want It to distribute the fake paper. Gawaker describes how the prank came together and here’s the reaction from the New York Times. There is also an online version of the fake paper, including a PDF. UPDATE 1: Noneck has a few copies of the fake NYT that he is selling on eBay. UPDATE 2: Here’s a CNN interview with Andy Bichlbaum (The Yes Men) and Steve Lambert (Anti-Advertising Agency).